HAMPTON — Nick Anzalone and his girlfriend, Jessie Kalish, have been living on Hampton Beach together for a couple years now. Whenever they go away for vacation, they always notice one big difference in their destinations and the tourist spot that they call home in New Hampshire. The couple began thinking seriously about opening a scooter rental of their own, and after a year of planning they opened Scoot-N-Around Seabrook Scooter Rentals, LLC, right next to Castaway’s in the Seabrook Beach Village District at 210 Ocean Blvd, in Seabrook. The shop official opened on Mother’s Day weekend but it had what they considered a grand opening on Memorial Day weekend. The single-seat black scooters and the green, low-riding, two-seated scooters, called “Scoot Coupes,” are registered with license plates, meaning that, upon renting one, you can drive it directly into the road and join the beach traffic that rolls through Seabrook, over the bridge and on the main stretch of Ocean Boulevard. So far the most successful form of advertisement has been for Anzalone and Kalish to take the scooters out and drive down the strip themselves. Kalish came up with the idea while she and Anzalone were waiting to open the shop on Mother’s Day. When they took the scooter out that sunny day, beachgoers swarmed them asking who they were and where they could get one of their own. Since then, it’s been their main form of advertisement. The couple originally tried to put the shop in Hampton, but they found it difficult to find a space to legally accommodate the scooters. They’re satisfied with the location they ended up with, though. It provides plenty of visibility for people driving up the coast from south of the New Hampshire border. “The thing we love about this location is that everybody who comes from Massachusetts up to Hampton Beach has to pass us,” Anzalone said. To make a reservation on a rental, call (603) 380-3966. 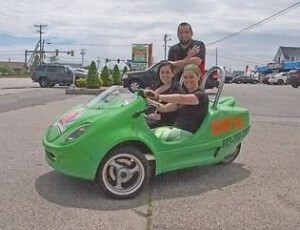 You can visit them on their Facebook page at www.facebook.com/SeabrookScooterRentals for more information. The store’s hours are 9 a.m. to 7 p.m., Monday through Thursday. Fun Mobile Adventure will take you to the famous Orient Beach where you can stroll the powdery white sandy beach or swim in the beautiful turquoise water, sunbathe, or just lounge in your beach chair, included free in your tour. Experience the curls and waves of the warm cresting ocean water, photograph breathtaking scenery, or partake in the water sport activities available. Options are yours! The drive is entertaining, exhilarating and enlightening as you will see the beautiful countryside, learn about the island culture, customs, and share in the beauty on this Dutch side of the island. Take your camera! Minimal restrictions make this adventuresome tour a “must do” for the entire family from 6 years old and up to fun loving and mobile seniors. The low riding Scoot Coupe can be challenging to enter and exit for anyone with lower back or knee injuries.